The genus name Mahonia was given in honor of American horticulturalist Bernard McMahon (1775-1816), who was a gardening mentor to Thomas Jefferson. Oregon grape is an evergreen herb native to western North America. It is drought resistant and will tolerate even poor soil and shady or sunny conditions; it is an excellent xeriscape plant. The leaves are prickly, but the stems are not. The hermaphroditic flowers are yellow, and the berries are purplish. Oregon grape has antimicrobial properties that are especially beneficial for the skin and intestinal tract. It also helps dilate blood vessels and thus lowers blood pressure. It is a traditional medicinal herb of several Native American tribes. It is used in the treatment of acne, boils, catarrh, debility, diarrhea, dysentery, eczema, gastritis, hepatitis, herpes, malaria, psoriasis, salmonella, shigella, and staph infection. 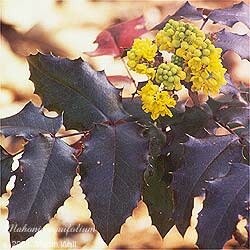 Topically, Oregon grape can be applied as a compress or poultice to treat boils, itchy skin, and wounds. The roots can be made into a gargle to relieve sore throat. The parts used medicinally are not generally considered edible. However, the flowers are edible, as are the berries, though usually they are deseeded first. The inner bark of the stems and roots is used to make a yellow dye, while the fruits yield a green or purple dye and the leaves yield a green dye. In folkloric tradition, Oregon grape is carried in medicine bundles or pouches to attract prosperity and popularity. Use only the dried plant, as the fresh root and rhizome can be excessively purgative. Avoid during pregnancy. Avoid in hyperthyroid conditions and in cases with excessive flatulence.